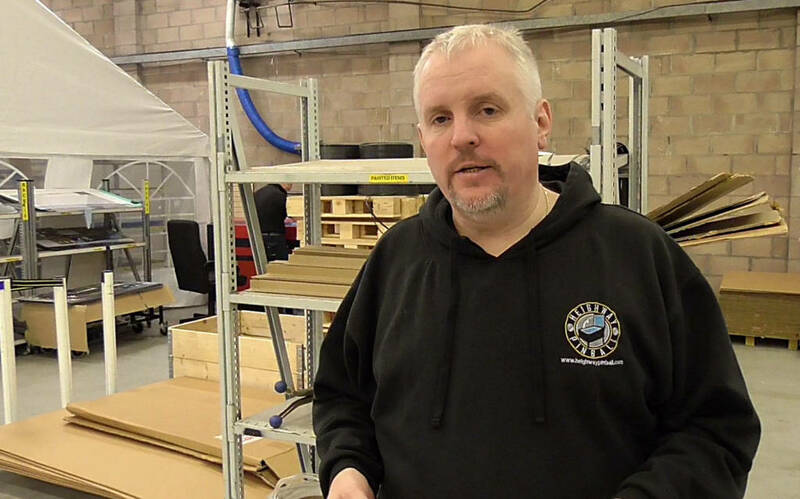 Yesterday, seven years after the company was founded, the liquidation of Heighway Pinball was approved by the remaining shareholders, bringing the story of the UK’s first pinball manufacturer to a close. That closure, along with the very few remaining company assets, means that anyone owed machines, parts, refunds, invoice payments or wages is unlikely to receive anything back from the liquidation process. For Heighway Pinball it really is ‘Game Over’. Andrew Heighway in March last year, three months before he left Heighway PinballOur original intention was to conduct a phone interview, but Andrew was concerned about inadvertently saying something which might ultimately result in legal action against him. As publishers of his interview, Pinball News was also concerned about this and offered him the opportunity to redact or remove only those parts of his answers which might be legally contentious. Andrew wished instead to have our questions submitted in advance so he could consider his responses, which was not something we were prepared to do in an audio interview. We felt it would be disingenuous to conduct a seemingly spontaneous and unrehearsed interview if Andrew knew all the questions we would be asking. We wanted to hear his instinctive reactions and interject with additional questions if we felt there were any points which appeared unclear or contradictory. Last edited by Ike Savage; 05-06-2018 at 02:58 PM. This one stoked my curiosity, and I did a fair bit of reading about it all. "Amateur" seems to describe this guy very well. Not a scam artist, but someone who likes starting his own business projects, with a bit of a silver tongue. He inspired people and excited them to the point of investing in him and working for him, but it sounds like he was instantly rather over his head. His massive ego and stubbornness just thrashed the whole thing out way longer than it should have gone. At the same time, it's possible that if he'd listened to good advice, a lot of it coming from his own people, the operation might have gained legs. IIRC at one point he had a marvellous opportunity to save a huge amount of operating expenses by working with a local UK arcade machine partner, but he insisted on doing everything in-house. Massive ego and terrible manager, pretty much. Last edited by Ike Savage; 06-09-2018 at 12:04 AM. Think you have read it all ? Skimmed through it, thanks. I remember he was being roasted for starting up the hydrofoil project in the midst of his PB venture battling for its life. Heighway conceded the hydrofoils were replaced by jetcats because they were often mechanically unreliable, but he will install more reliable and economic engines in Italy. He hopes nostalgia for the Curl Curl will fuel the voyage, and help it find a new home on the harbour as a commercial venture. Still the same overreaching M.O. it sounds like. But who knows... I guess this will be a much simpler project and maybe it'll actually work out this time. I presume this guy has a nice inheritance or core source of income to keep getting involved in these projects. The suspicion is this will be his umpteenth failed business in which he got in over his head and had to weasel out.